Former Oklahoma quarterback Kyler Murray was already the favorite to be the No. 1 pick in the NFL Draft. Now, his odds have fallen even further. Kyler Murray might want to start house hunting in the desert, if the oddsmakers are correct. The Heisman Trophy-winning quarterback opened at the Westgate SuperBook as the favorite to be the No. 1 overall pick after the NFL combine earlier this month. And his odds have fallen even farther. The 21-year-old is 1/5 to be with top pick as of Monday after opening 5/7 on March 5. The first round of the draft is April 25 in Nashville. [BetOnline originally had Ohio State defensive end Nick Bosa as the favorite to be the top pick. ](https://www.betchicago.com/nfl-draft-2019-odds-nick-bosa-favorite-first-pick) Bosa is 5/2 at the Westgate after starting 5/4. 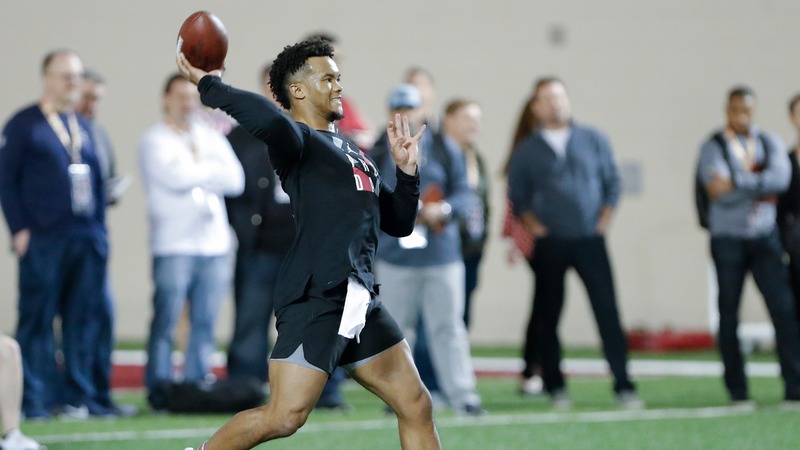 Murray’s push to 1/5 comes after a [strong performance](https://www.usatoday.com/story/sports/nfl/2019/03/13/nfl-draft-kyler-murray-impresses-oklahoma-pro-day-performance/3154284002/) at his Oklahoma Pro Day last week. Alabama defensive tackle Quinnen Williams has the third-lowest odds -- 10/1 --. [I recently made a case for Williams as a smart bet for the top pick because his odds are so enticing. ](https://www.betchicago.com/quinnen-williams-longshot-bet-first-draft-pick-nfl-draft-odds) And [our Tommy Stokke earlier explored the odds opportunity Murray-mania](https://www.betchicago.com/nfl-draft-2019-odds-kyler-murray-rumors-bosa-williams) was creating. That premise holds true even more with Murray at 1/5. Oddsmakers are banking on all the [speculation](https://cardswire.usatoday.com/2019/03/16/nfl-mock-draft-az-arizona-cardinals-trade-kyler-murray-nick-bosa/) linking Murray to the Cardinals, who have the top pick. [I got in the action in a mock draft earlier this month as well. ](https://www.betchicago.com/nfl-mock-draft-2019-kyler-murray-no-1-pick-combine) All this Murray-Arizona talk started when the Cardinals hired Kliff Kingsbury as head coach. Months earlier, when Kingsbury was head coach at Texas Tech, he [said](https://www.sbnation.com/2019/1/10/18176792/kliff-kingsbury-kyler-murray-2019-nfl-draft-no-1-overall-good-news-kliff) he would make Murray the No. 1 pick if he had it. As fate would have it, Kingsbury has it. It has stated this firestorm, and oddsmakers are buying into it. ## No.1 pick odds (Westgate) QB Kyler MURRAY (OKLAHOMA): 1/5 DE Nick BOSA (OHIO ST.): 5/2 DT Quinnen WILLIAMS (ALABAMA): 10/1 LB Josh ALLEN (KENTUCKY): 15/1 QB Dwayne HASKINS (OHIO ST): 50/1 QB Drew LOCK (MISSOURI): 80/1 OT Jawaan TAYLOR (FLORIDA): 80/1 WR DK Metcalf (OLE MISS): 100/1 DT Rashan GARY (MICHIGAN): 200/1 CB Greedy WILLIAMS (LSU): 200/1 DE Brian BURNS (FLORIDA ST.): 300/1 OL Andrew DILLARD (WASH ST): 300/1 DT Ed OLIVER (HOUSTON): 500/1 LB Devin WHITE (LSU): 500/1 DE Montez SWEAT (MISS ST): 1000/1 __PLAY:__ Our [free daily contests](https://betchicago.chalkline.com) for the chance to win a BetChicago prize pack.